There’s an article on Consumer Reports website last week with the organization’s latest test results on toilet papers (which will also appear in the May issue of Consumer Report magazine). The article has some interesting findings that could affect which brand we will buy in the future. At just 6 cents per 100 sheets, Scott 1000 delivered the most sheets for the lowest price. But because it was also the thinnest and wimpiest toilet roll we tested, you could wind up using more of this lower-scoring roll than you bargained for. Next time when we shop toilet paper, we will have to check out one of CR’s best buys: Kirkland Signature. In early February, Chase quietly started to impose an annual fee of $120 on some credit cards with a large amount of balance at a low rate. Even though Chase said that the fee only applies to those accounts that made a little progress in paying off the balance, the move provoked angry reactions from cardholders as well as consumer advocacy groups. Under pressure, Chase abandoned the plan and said it will refund card members the $10/month fee late last month. Starting with June account statements, any credit-card customer who carries a balance and has an interest rate below 10% will see his or her rate jump into double-digit territory. Even though government agencies have passed new rules to regulate the credit card industry early this year, the stronger restrictions will take effect until July 2010. At the same time, credit card issuers seem to be on the rush to change the terms of credit cards when they still can at will. Another 0% BT from Bank of America. What to Do with the Money? 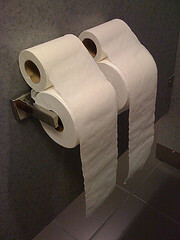 Kirkland Signature offers two types of toilet paper. One version, in individual paper wrappers, seems to be the equivalent of Scott. The version in the individual plastic wrapper seems to be the equivalent of Northern. I wasn’t able to access the CR ratings to determine if CR rated them differently. My preference is to buy Charmin, when Costco offers the $2.50 off coupon With the coupon, I think the cost is pretty close to Kirkland Signature.